Kim Ji Soo (김지수), or just Ji Soo, is stepping right into So Ji-sub’s shoes for ridiculous photoshoots. I don’t even know what he is wearing in two of these shots, which of course are the two shots that I love the most. Like the, hopefully not real, mink and knit coat in the above image and dare I say velvet vest underneath? Followed up by these gold snake skinned pants. Because if you have to have snake skinned pants you better make them gold. I won’t even mention the velvet jacket that I’m sure is part of that vevet vests three piece suit. Will we see the entire pair int he full spread to come? Please? This outfit is much more tame compared to the other two. Sure he’s wearing a winter jacket at the same time as rocking absolutely no shirt underneath, but it’s fashion. It does not have to make sense. This outfit actually reminds me of those days I used to go out in wintertime with two pairs of tights on and a jacket with a regular dress because I did not want to have to carry a sweater and scarf and earmuffs with me. Of course, looking back I probably could have checked everything at the jacket check at the entrance. You are wiser with years, y’all. And the preppy cream of the crop as Ji Soo turns into the young Texas gentleman that everyone wants their daughter to bring home. All he needs is a bolo tie and this look is set. 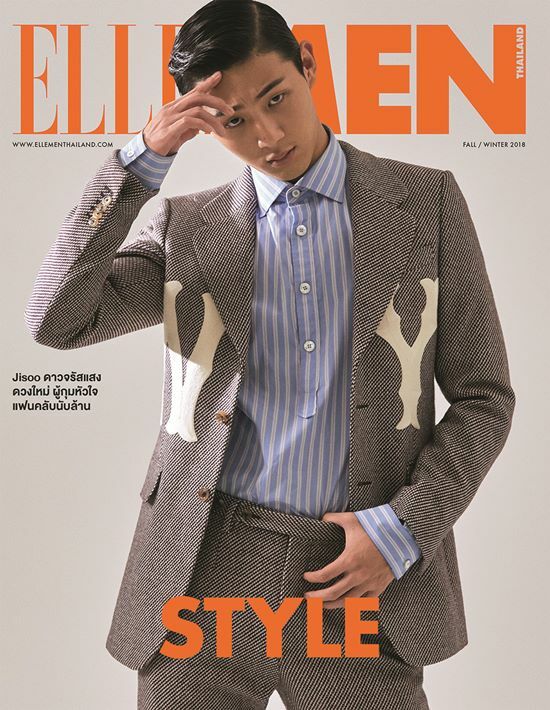 If you live in Thailand then you will have to catch the Winter/Fall 2018 edition of Elle Men and let us know what other looks Ji Soo pulled out of his hat.